Kenmore upright and canister style vacuum cleaners are equipped with a dirt sensor that shows users if dirt remains in their carpet. 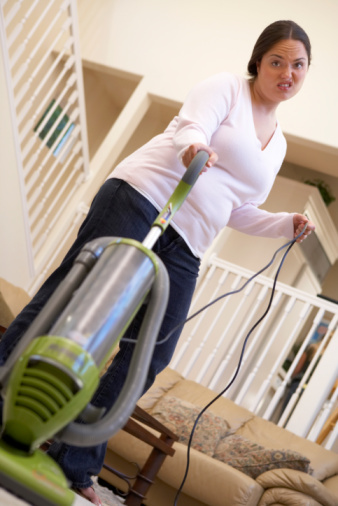 When the vacuum is running, dirt and debris is drawn into the vacuum cleaner. The sensors see the dirt, and an indicator light comes on to alert users to more dirt in the carpet. Over time, the sensors can accumulate dirt and debris, which gives a false indication about the dirt in the carpet. Clean the dirt sensor regularly to get an accurate reading on the dirt left in your carpet. Pull on the bag cover release latch, and remove the bag cover from the vacuum cleaner body. The latch is located on the front of the machine. Hold the top of the bag, and gently pull on it to remove it from the bag holder. The bag holder is a small circular tab on the vacuum cleaner body. The two dirt sensors are located within the circular tab. Wipe off the dirt sensors with a cloth to remove accumulated dirt and dust. Do not use cleaning agents to clean the sensors as they may degrade the sensors. Replace the dust bag and the bag cover, and use the vacuum cleaner as normal. Press down on the wand release pedal located on the main vacuum nozzle, and pull up on the wand to remove it from the main nozzle. Locate the dirt sensors on the inside of the wand swivel. The sensors are small and circular and located in the ring section of the swivel. Brush the accumulated dirt and dust off the dirt sensors with a bottle brush or a toothbrush. Place the wand back in the nozzle by lining it up inside the swivel, and pressing down firmly until you hear a click.